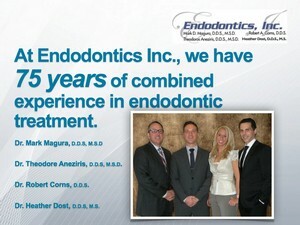 Welcome to Endodontics Inc., a specialty practice dedicated to your oral health. Our Mission is simple: to provide you with the finest endodontic treatment available anywhere. We are pleased to welcome you to our practice. Our office offers progressive, quality endodontic treatment. Our procedures range from root canal treatment to surgical procedures to save compromised teeth. At Endodontics Inc. we enjoy a high success rate, which can be attributed to our attention to detail throughout our procedures, our excellent specialty training, and our up to date methods of practice. Microscopes and other types of high powered magnification are used to enhance our procedures. Fiber optic lighting is used to visualize cracks or fractures in teeth, and digital imaging is used to capture photographs and images throughout our treatment. This aids in communication with the patient, and improves patient understanding of their treatment.